The Kingz 550 Comp BJJ Gi is a pearl weave style gi jacket & 11oz cotton pants combo. It has some cool flair added, but nothing too flashy . It is a bit flashier than my Ronin Insignia, but only ever so slightly. It fit me different than any other gi I own (more on that below!). My Kingz 550 Comp BJJ Gi came from Fighter’s Market. 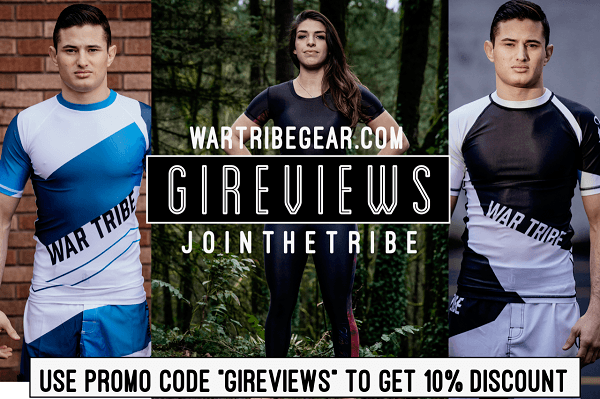 I spoke with Bruno ahead of time via e-mail about the various gis they sell, and also about them offering their own brand of BJJ gis. The first thing I noticed is that the Kingz 550 Comp BJJ Gi fit me a bit differently and I e-mailed Bruno and he replied right away(again, more on that below!). Fighter’s Market offers really good customer service and I would definitely suggest that you send me or Bruno an e-mail (or just post below!) 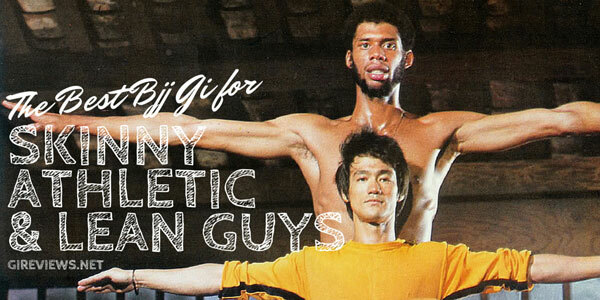 if you have any questions about the gi. Right out of the box, my Kingz 550 Comp BJJ Gi fit me really well, with one exception. While the pants were fantastic, the width of the jacket and sleeve length were perfect, the gi jacket was very long on me. I had never tried on a jacket before with that type of length in the skirt. Now, at first it felt weird, but I noticed that it helped my gi from coming undone since I like to wear my belt extremely low on my hips. How awesome is that! I typically fit A3s perfectly so if you’re around 200-210lb. but taller than 6’1″, the A3 Kingz 550 Comp BJJ Gi in “L” sizes may be a perfect gi for you! My Kingz 550 Comp BJJ Gi was a very sound model from a design standpoint. All of the stitching and reinforcing was solid and I wore it exclusively for a few weeks to see if I could find any kinks in the armor, but none were to be found. Also, I washed it only on cold and only hung dried it because it already fit me perfectly. This is the case with most A3 gis. 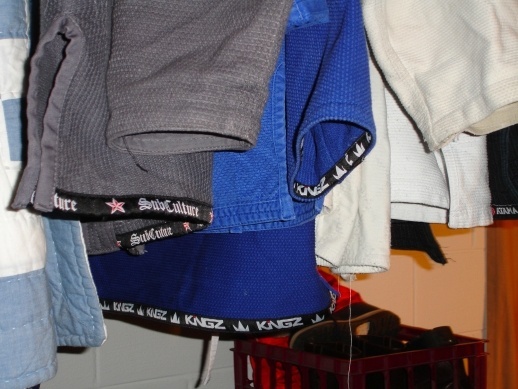 My favorite part of the Kingz 550 Comp BJJ Gi design has to be the patches. They are very cool and basic logos and are really the type of design that I favor. I love the subtle patch on the front skirt and the pants. 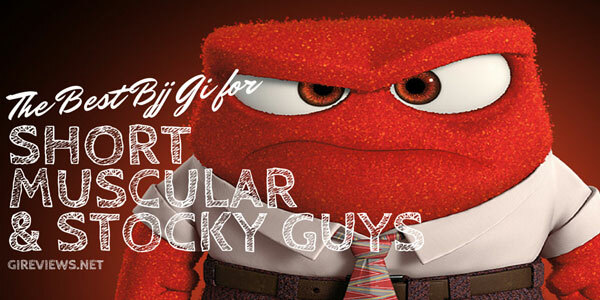 A plus is that the patches say the type of gi that it is. I think this is really cool because if I own multiple Kingz gis, which is likely in the future, I will easily be able to tell them apart (also, it’s just sorta neat because nobody else does this). I also really liked the solid bold colors of the shoulder patches, especially the subtle crown design at the end. I really like the cut of the Kingz 550 Comp BJJ Gi jacket, especially around my midsection. Like I stated above in the design, it did fit long on me, but I am sure that with their new gis, the length of my gi will be found on their A3L (A3Long) gi for taller athletes. I really like the seam taping on the inside of the jacket sleeves and the shoulder patch designs as well. The lapel is decently thick as you might expect to find on a single weave gi. The Kingz 550 Comp BJJ Gi trousers are where this gi really shines. They are deceptively thick, but I didn’t feel any issues with them when rolling. If you prefer lighter pants, I’d suggest their Kingz 420 Light or Kingz Ripstop Model. I really like the 6 rows of stitching along the bottom of the pants (more than is necessary to be functional, but very cool looking), as well as the 6 drawstring loops and double knee padding. Probably the coolest part of theKingz 550 Comp BJJ Gi is the flex panel crotch. These can also be found on some Hayabusa gis and the Sprawl gi pants, and, so far, have held up just fine. I find that I like it most for its breatheability (is that a word?) during long strenuous practices. The Kingz 550 Comp BJJ Gi was a pleasure to roll in. The long skirt didn’t play into any advantage or disadvantage when rolling (other than allowing me to wear my belt really low and still keep my gi closed, which was sort of nice!). Like I’ve written before, I prefer heavier gis to lightweight ones with thin collars, so I think this is a great gi for me. 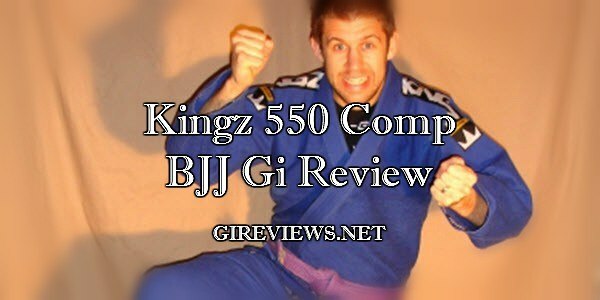 The Kingz 550 Comp BJJ Gi is definitely a great gi, especially of the mid-range priced gis. I think they could easily charge more for the gi if they wanted to give the quality of construction, patches, flex crotch, and stitching. Even more impressive than the gi was Bruno’s willingness to make necessary changes to the model in future batches. I am sure by the time you are reading this, those changes have already been made, Illuminati-style. Please post your thoughts on the Kingz 550 Comp BJJ Gi below! Sweet review, the length of the top looks like it would be a Judo Gi. Yeah, it is really really similar. I really prefer short skirts myself, but I can see people liking them a lot. Agreed. Their patches are very well done. Bold and clean is definitely the way to go in my opinion. And yes! The gi really is that awesome shade of blue. Granted, I’ve only been wearing it for a month of training, but it’s still holding up really well since I wash it on cold and only hang dry it. Wow! Have you emailed them? Great review, thanks for the help! I picked a black one and for other’s reference, I’m 6’1″ 190-195 lbs, I got an A2 top with A3 pants and both fit great. The A2 pants were too short and they were quickly exchanged – excellent customer support! Perfect! I’m starting to think that I need an A2 top instead of an A3. The more in-shape I get, the more I’m noticing that the A3 tops are too big. But the issue is that the a2 top may be too narrow in the shoulders. Kingz is a fightersmarket gi. The owners of fightersmarket are the same owners of the mmagear.com that based out in Brazil. I had such a bad experience with mmagear.com that I would never deal with fightersmarket. Just thougth I would bring that out there. Bruno owns mmagear.com as well? What happened? It was my first experience with fighter’s market but custumer service was great. As mentioned, I needed to mix my top/pants sizes after receiving and they accomodated quickly. BTW, my black Comp is holding up great after numerous rolls. 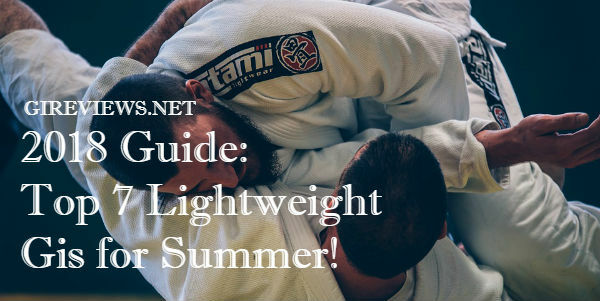 A training partner has the same gi and only issue is a split in the rubber collar (not the fabric – just underneath) on the lower lapel. Otherwise, he loves it.